We have had rather a wild week of weather here in South East Queensland. I have never experienced so much rain and strong winds. Fortunately the area that I live in Brisbane has not been affected by the floods. The only damage we have had were trees being uprooted and the shade clothes at the local shopping centre coming down. The hardest hit area has been Bundaberg which is about a five hours drive from here. People have had to be rescued by helicopter. The force of nature is unbelievable. Hopefully we do not have to experience another ex cyclonic weather system again this summer. 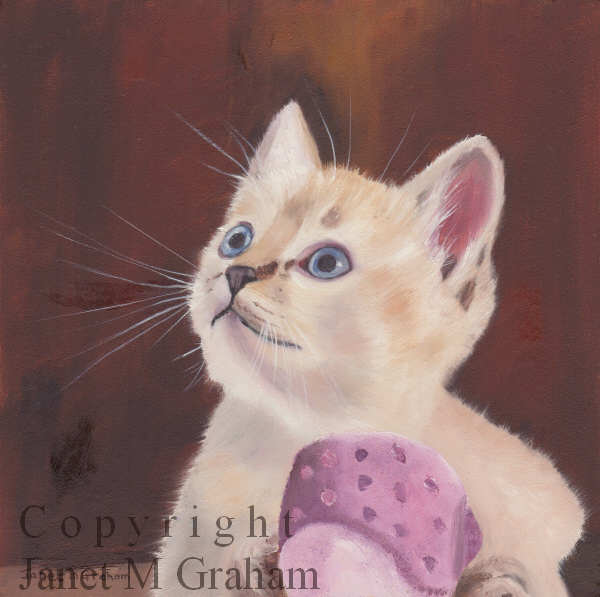 On a brighter note, I did manage to paint this cute little kitten. The title "Is Playtime Over? seemed rather appropriately. 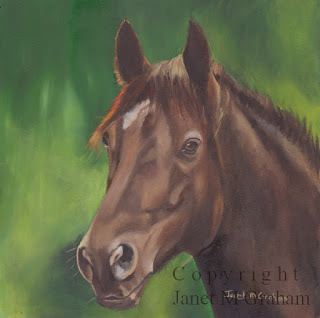 I have family staying with me at the moment so it is a bit difficult to paint. Hopefully I can finish another painting this week. Is Playtime over? is painted on 6 x 6 Ampersand Gessobord. Many thanks to Judy for the reference photo. Sometimes a title for a painting just comes naturally and other times it takes me forever to think of a title. 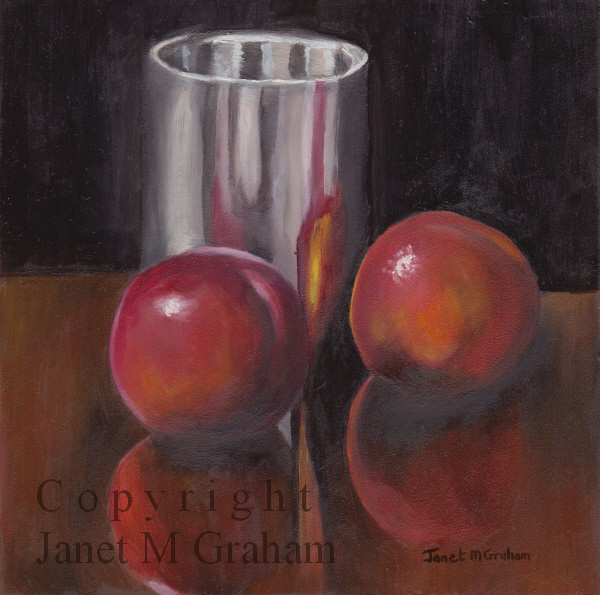 This time around the painting sort of named itself as I love the way the nectarines are reflected in the silver jug as well as the table and so the title Reflections seems rather appropriate. Reflections is painted on 6 x 6 inches Ampersand Gessobord. Enjoyed painting this one. It is a yellow peach. Love the colours. On the weekend I came across another variety at the fruit shop - Golden Queen peaches. They are really delicious - taste better than the yellow peach variety. They are more "peach" in colour. Will have to buy some more and do still life painting that includes them. 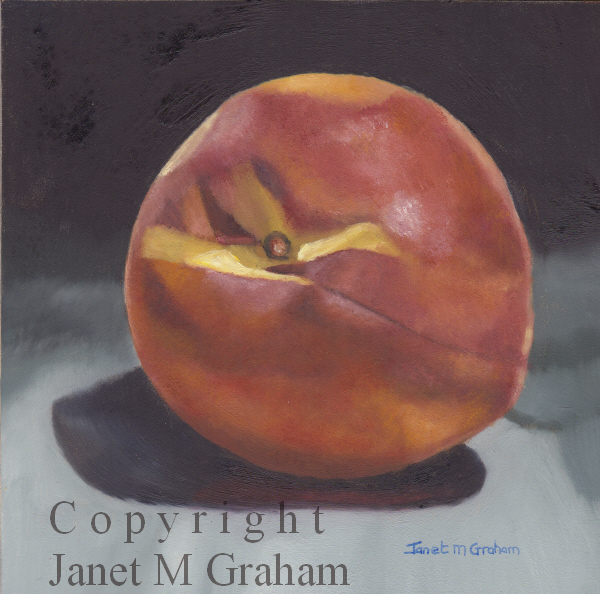 Peach is 5 x 5 inches on Ampersand Gessobord. 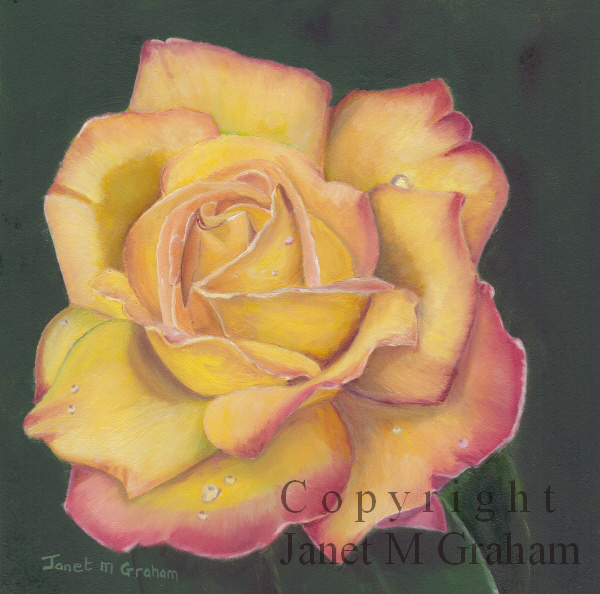 Decided to paint another rose. Thought the rain drops were rather a nice touch. It is 6 x 6 inches on Ampersand Gessobord. 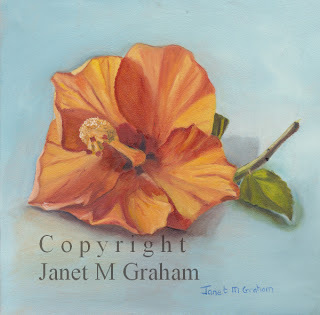 I actually went outside to look for a lemon but saw that the hibiscus was flowering and it looked so beautiful that I decided to paint it instead - can always pick a lemon another day. It is 5 x 5 inches on Ampersand Gessobord. 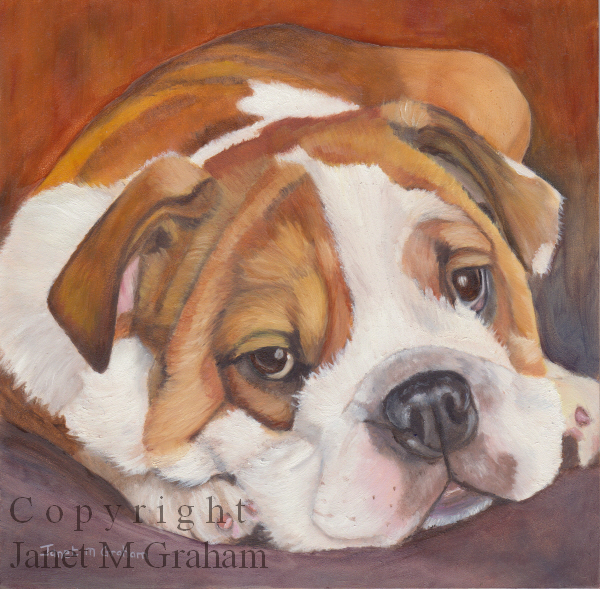 The one art forum I belong to runs a challenge ever now and again and this month it was a very cute Bull dog puppy. I couldn't resist painting this adorable little puppy. It is 6 x 6 inches on Ampersand gessobord. Was going through a few of my photo's and came across the photo's that I took in October 2011 when visiting an open garden in Maleny (Maleny is about a 30 minute drive from where I live). It is a lovely garden which has actually now opened up as a botanical gardens (http://www.malenybotanicgardens.com). So how did I end up with horse reference photo's? Well the neighbouring property had horses and they seemed rather curious to all the comings and goings so naturally I took photo's of them. I did also take photo's of the gardens and will probably use some of them as reference photos in future landscape paintings. Wasn't sure on what title to give my painting. I think horses are such beautiful animals so eventually settled on "Brown Beauty" as the title. The painting measures 6 x 6 inches on Ampersand Gessobord. This is my next still life. The lemon was about the same size as the teacup! Our lemons can grow to rather a large size. The reason being is that we have a worm farm and they produce what I call "worm juice". The plants love it and since using it on the lemon tree we tend to grow rather large lemons. It is rather handy having a lemon tree around - there is always one ready to be picked when you need one. Was fun painting the lemon so I am thinking of doing another painting featuring just a lemon or lemon pieces. 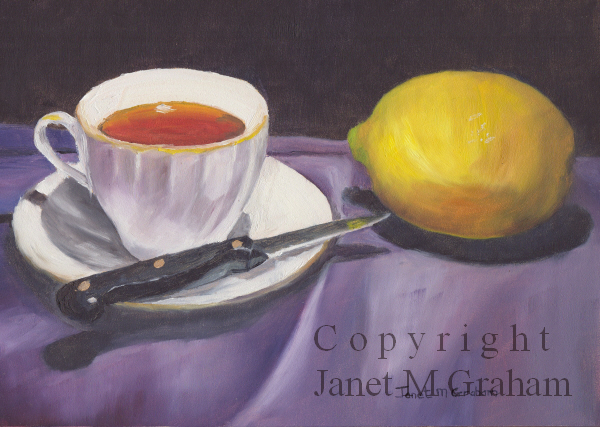 Lemon Tea measures 7 x 5 inches on Ampersand Gessobord.